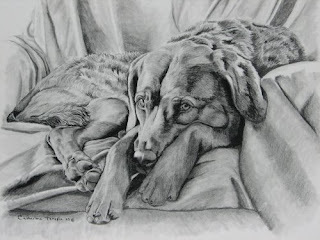 I am so pleased and excited to share the news with you that my drawing of my dog Maggie entitled "It's MY Chair" has been selected to participate in a national juried art show dedicated to canine art. The Art Show at the Dog Show is an annual event held in conjunction with the Sunflower Cluster Dog Show in Wichita, Kansas. I am almost beside myself with excitement as this is the first national art competition that I have ever been juried into! My entry will travel next week to Kansas and will then be judged along with many other amazing entries for various different awards and a chance at being awarded Best in Show. If chosen for that honor there will be a nice cash prize and my artwork will become a part of the AKC Museum of the Dog permanent display. That would be VERY exciting!!! As it is, just being chosen to be in the show is a great and wonderful accomplishment as there were 580 entries from 200 artists and from what I've seen of the artwork that was chosen I am humbled by the talent that will be represented there. The art will be on display at three different locations in Wichita. 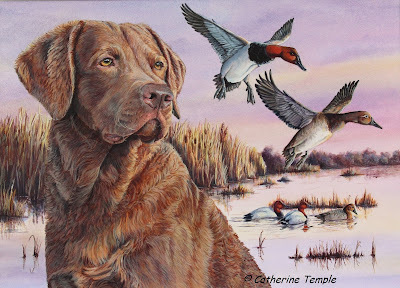 It will be at The Foyer Gallery in the Century II Convention Center, the CityArts Building, and the Sunflower Cluster Dog Show at the Kansas Coliseum from March 3rd -April 5th. All artwork will be for sale so if you have an opportunity to be in Kansas then stop by and enjoy the show!